It looks serious. 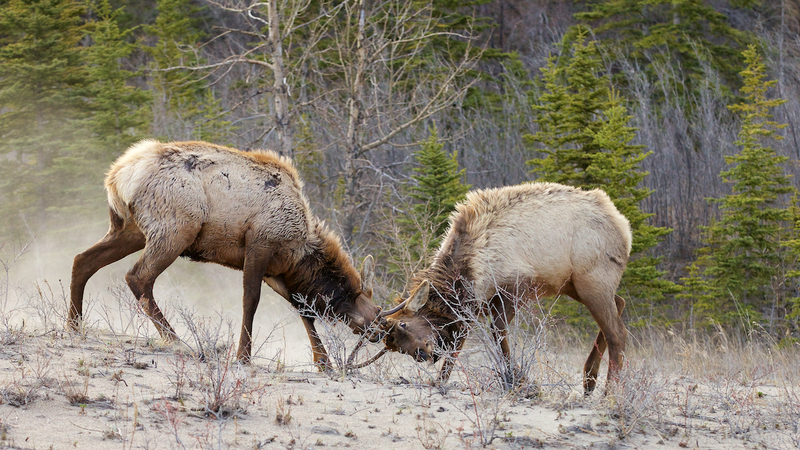 Two young bull elk going head to head. Great action! But wait a minute it’s spring so that means no females going to the victor. This isn’t the elk rut. What’s going on? Hey there’s another guy other there. I’ll just go and start a fight for no good reason. What a great idea. A true story my son told me might put this in perspective. In his early 20s, he went tree planting in the mountains for the summer. Each day they drove from their camp to the worksite. My son’s good friend was the team leader so, of course, he drove the truck with the crew. Every morning they would drive down the same road and every morning they managed to hit the same large pothole. Finally my son muttered, “Every day,” when they hit it again. That must have hit the mark because his friend stopped the truck and the two of them wrestled in the ditch for a few minutes before merrily going on their way. Sometimes young guys just need to blow off a little steam. 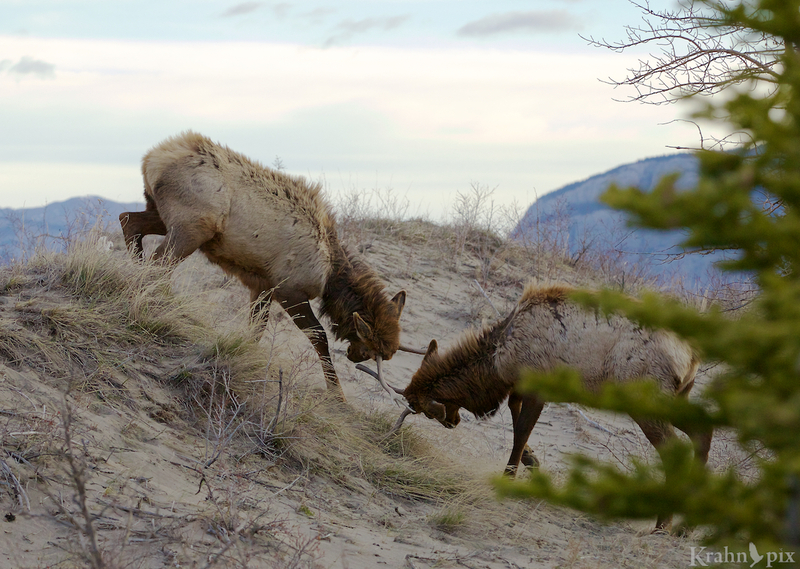 As I was watching the two elk, the larger kept bugging the smaller one until a tussle ensued. Shortly after they were back to eating again beside each other. If there’s a chance of guessing what animals are thinking, I like to step right in! And if someone thinks it works, that’s even better. I love these photos, especially the second one. I quite enjoy drawing the comparisons. The fun part is no one can prove me wrong! I guess they are just practicing for the real deal! 🙂 Very good picture anyways, like how they have kicked up the dust in the photo. Practice makes perfect. I quite like the dust too – helped along by sandy soil and a wind. Good place to do it. Ha, we have dogs like that. Clyde is currently sporting a hole in his head courtesy of the much larger Bo. Boys! Yes those boys! But nothing will stop them. I’d sure pay for a bottle of that! Yes I wish I could find mine wherever it went. I always thought I would be the old guy in the wheel chair using my cane to hook on to the guy in front of me in another chair. I guess we’ll see if that happens down the road. Beautiful photos, Lyle! Yes, youngsters all need to let off steam. Rutting season is when I worry though – the male deer here make matchwood out of my blueberry bushes, scraping their horns. At night, if I am outside sitting quietly, I can hear the clicking of antler on antler as they spar. That must be an interesting sound to hear coming from the darkness. 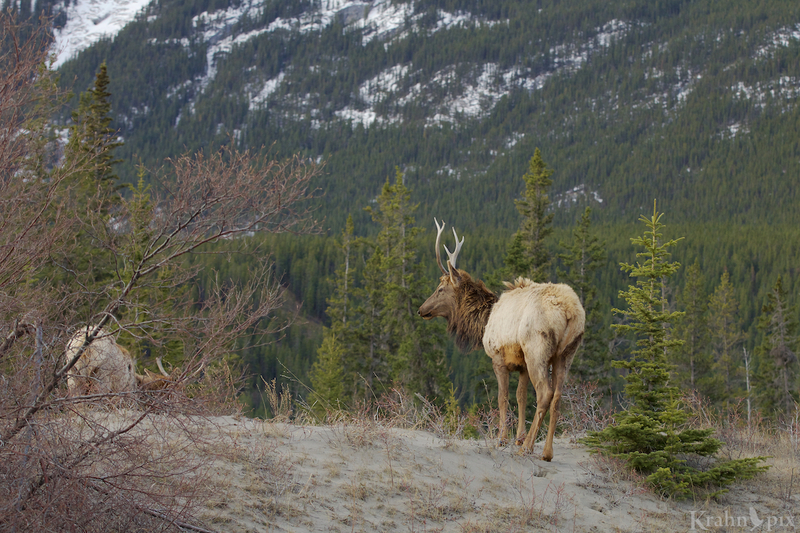 The rutting season is certainly time to give the guys a lot more space – I’ve seen some pretty crazed look on bull elks. That’s the thing with boys. They pick on each other until they fight and blow off steam, and then they are buddies again. Girls on the other hand…. They do seem to approach these things differently! Wonderful shots at a great place. I guess they are just practicing for the ladies. It won’t be long to get into fighting shape. This looked serious enough but the grander play requires a lot of practice. It was a great place and a grand view of proceedings. Great shots ~ the middle one being perfect as it mirrors the story well. And what a perfect, hilarious story it is. Makes me miss being young, foolish and full of life & energy 🙂 Cheers! I’m with you on that. There is, a times an irrational exuberance, from a seemingly bottomless pit of energy that is fun to spend. Where did it go? I’m pleased you noted the middle one because I would never have posted it without the fit to the story.